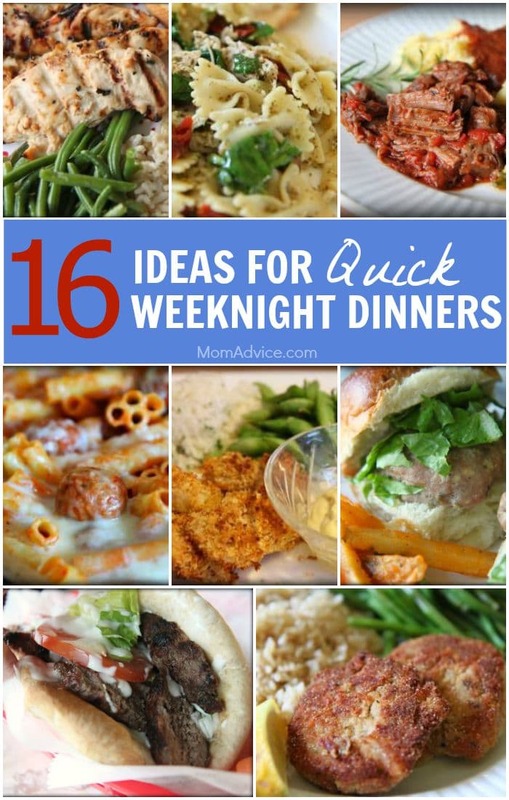 The school year is upon us and along with that comes the chaos of planning what to make for dinner each night so I’m sharing 16 easy weeknight dinners that are perfect to share with your family around the dinner table. These can be made very quickly or can be thrown in your slow cooker for those busy nights full of activities after the school day has ended. I’m also including ideas for side dishes that are just as easy. They happen to be our family favorites and I know that they can be your family’s favorite too! Don’t forget that you can use our free printable meal planner or use the menu planner in our Home Management Binder to get your dinners organized! Skip heading out to your local gyro joint and enjoy a gyro at home with this handy recipe. The toppings and sauce can be prepared the night before and keep a package of store-bought pitas in your freezer just for this easy weeknight meal. This one is ready in about twenty minutes. Serve this delicious dinner treat with baby carrots. Rosemary Chicken is my go-to dish that can be made with a couple of ingredients that you likely already have in your pantry. If you do not have fresh rosemary on hand, you can substitute with dried rosemary instead. This quick chicken dish makes for fantastic leftovers that you can put in tortilla wraps to send to school with your children or can make a fantastic addition to a delicious salad. Serve this easy and elegant chicken dish with a side of pesto rice and microwave lemon broccoli for a quick dinner that the whole family will love. Even if you have never been a fan of salmon patties before, I believe this recipe can convert anyone over to this easy and frugal weeknight dish. These patties are filled with a little lemon zest within the patty and a baked potato to stretch the salmon The breadcrumb coating made with Italian breadcrumbs and grated Parmesan makes these taste like something served at a fancy seafood restaurant and a little squirt of fresh lemon juice turns boring cans of salmon into something spectacular! Serve these wallet-friendly wonders with my easy perfect baked potato and lemon roasted green beans. 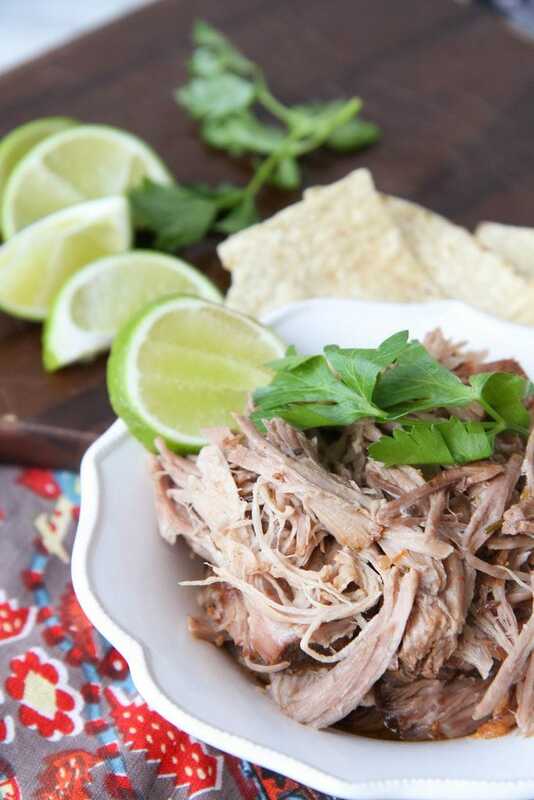 Pulled Pork Sandwiches not only make the perfect slow cooker dish for busy weeknight activities, but they just so happen to make the world’s greatest leftover sandwiches for other nights too. This pulled pork can be simmering away in its root beer bath while you tackle all of the rest of the day’s activities. Serve these sandwiches on whole wheat buns with corn on the cob or a bag of frozen corn. Fewer dishes are loved more by me than this simple dish that can be created out of frozen chicken when you (whoops) forget to thaw your chicken for the evening’s meal or that can be popped in the slow cooker when your family feels swamped with activities. I love to serve this dish over spaghetti noodles or baked brown rice with a simple salad. Entertaining your child’s entire football team? Have company coming on a school night? This is your dish because it is made with store-bought meatballs, can easily be doubled, and can be prepared the night before so it is ready to go. This isn’t your typical dried out ziti thanks to the addition of chicken broth to the sauce, which really coats the noodles well and adds a depth of flavor to the dish. Serve this with some easy Portuguese White Bread (made in your bread machine, of course) and a spinach salad. This braised balsamic chicken comes together in a mere twenty minutes, but tastes like it has been cooking all day long. The balsamic vinegar compliments the diced tomatoes perfectly and the addition of these spices makes this dish a true winner in our home. Serve this braised balsamic chicken over angel hair pasta and with your favorite side salad. You want simple, easy, and less dishes? Skillet suppers are the way to go and this one is packed with veggies and flavor. This dish has all the ease of Hamburger Helper, but without the sodium and preservatives that you really don’t want your kids to be eating. Serve this simple supper with bowls of applesauce on the side and prop those feet up thanks to a night free from a kitchen full of dishes. This is another night for embracing your vegetables and not embracing dishes. This Skillet Ziti with Chicken & Broccoli can easily be personalized with fresh diced tomatoes on top for the tomato lover’s in the family. To make this dish vegetarian, just omit the chicken and up the veggie quotient. With the sprinkle of tomatoes or a handful of sundried tomatoes and spinach, it could make this a veggie packed dish worth repeating. Serve this fun dish with your favorite fruit and slices of whole grain bread with butter. While breading fish can be a bit labor intensive, this dish can easily be done in stages for quick assembly in the evening and is truly a dish that the whole family will love. These tilapia nuggets can replace your kid’s adoration for those fried chicken nuggets and offer a fun & healthy choice in their place. Serve the nuggets with lemon rice pilaf and steamed edamame. I love to make these sides in my rice cooker, for a fun meal that is ready in under thirty minutes. This delicious dish is the one that I go to whenever we have unexpected company or when I am looking to make a dish that I can serve as an elegant lunch the next day. This dish restaurant-worthy and can easily be doubled when running a meal to someone else. Once you try this one, I promise that it will go into your regular rotation forever. Serve this dish with lemon roasted green beans. My Pot Roast Italiano is guaranteed to knock your socks off and will change any feelings you previously had about roast forever. This roast simmers away in the slow cooker all day and at the end of the cooking, a can of tomato paste is whisked in to finish off the delicious gravy. I served the roast over cheesy orzo pasta and with a simple side salad. Leftover meat can be placed into slider rolls for Italian beef sliders the next night served with tortilla chips and carrot sticks. You will notice that few of our recipes have convenience foods or mixes in them, but this roast is my one exception to the rule since it relies upon three packaged mixes to create. Do your best to look for low-sodium mixes though and avoid adding any salt to this recipe. These three little mixes and some water make the most flavorful roast. Not a hint of dryness in this roast and the leftovers heat up perfectly for a special lunch. Serve these easy sandwiches on whole wheat buns (homemade or store-bought) with fresh apple slices and glasses of milk. Made from ingredients that are likely already in your refrigerator and pantry right now, these simple ingredients are exceptionally delicious and create a flavorful & juicy chicken tender that you will absolutely love. This recipe yields a pound’s worth of tenders. I triple the batch for salad topping and grilled chicken wraps that make easy weekday lunches or a busy weeknight dinner for another night in our house. Serve these with baked brown rice and baby peas. This dish replicates the flavors from my favorite meal at a local Italian restaurant. With the simple addition of sautéed mushrooms, spinach, and sun dried tomatoes, it takes this easy dish to an elegant level with minimal effort. Of course, no dish is complete without my signature addition of lemon zest and a squirt of lemon juice to freshen and lighten the flavors. The best part about this dish, in my opinion, is that it incorporates items that I already have in the pantry and can easily be pulled together with leftovers in the fridge. Leftover chicken, vegetables, and any type of pasta can be pulled together for a dinner that is worthy of an evening gathered with friends and family around the dinner table. Serve this elegant dish with my easy pumpkin cornbread muffins. Sliders are a new addition to our family’s meal rotation and I guarantee if you try these that they will go into your rotation too! These Italian Turkey Sliders not only are quick to prepare and easy to bake, but thanks to their tiny size, these pint-sized sliders are ready in only fifteen short minutes. Sliders are not only highly fashionable for entertaining, but they also are super fun for little ones who will appreciate your small burger efforts as a way to make the dinner hour more fun. Serve these with homemade oven fries for a fun dinner at home. What meal always makes it into rotation at your house? 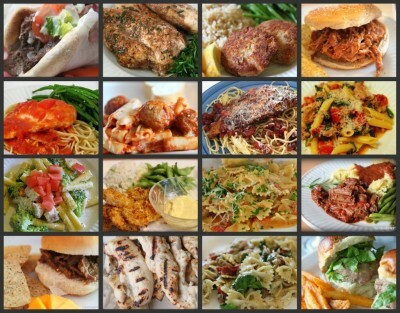 Have you tried a meal from this list? Note: Originally published in 2011, this remains one of our site’s most-searched articles so I’ve updated it with a Pinterest-friendly header to go along with our M Challenge Focus on Meal Planning. 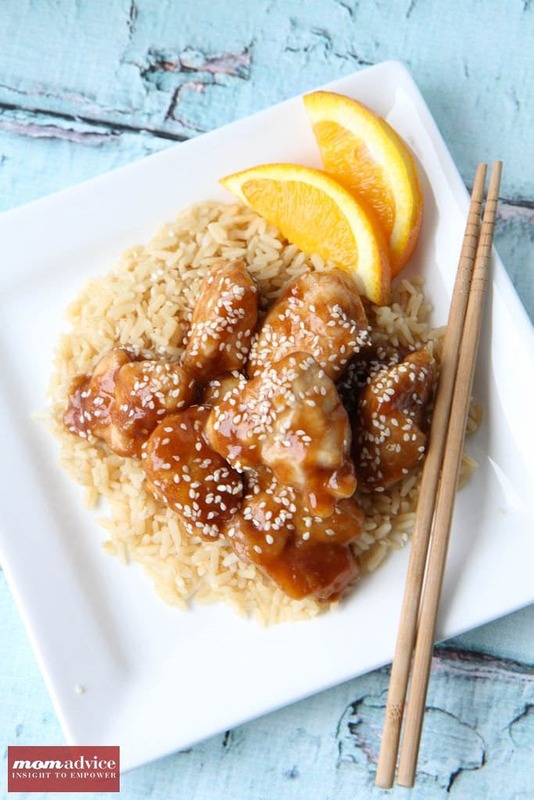 These dinner ideas are perfect for busy school nights! One of the most stressful parts about my job as a mom is creating menu plans to feed my family and accomplishing the weekly grocery shopping. 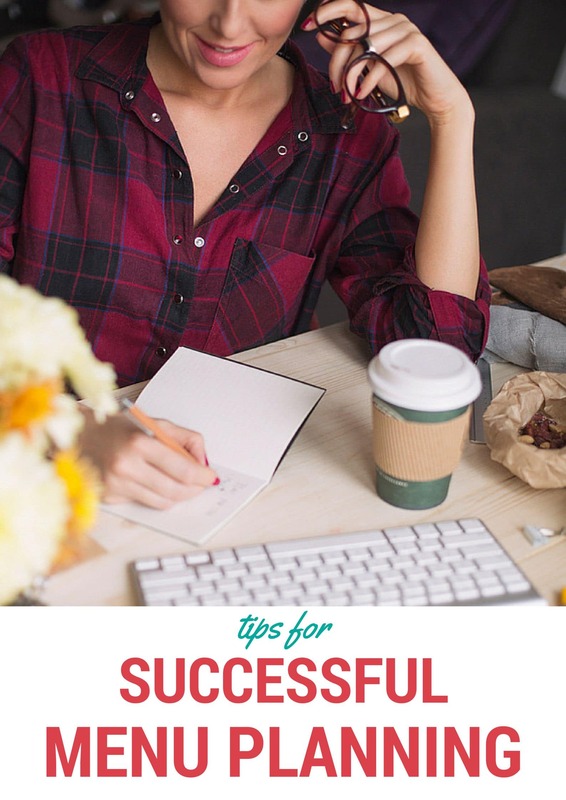 Today I want to share with you some of my own tips for successful menu planning, but first I want to work on some honesty with you about my attitude towards food preparation in my house. Is it okay to say that I have a terrible attitude about this? I hope it is because something happened this summer that has helped transform my mindset a bit. This summer I wanted to create some great learning experiences for my kids and to teach them how lucky we are for all that we have. One of those experiences has been volunteering at our church’s food pantry where over 400 local families are served each month. I had not expected the enthusiasm that these two brought to the job, but these kids were so happy to do this that they begged to return the next week to help again. I am not sure what it is like for you and your children, but I feel like we live in this protected bubble that I am constantly trying to push them out of… but not TOO far. I’m pushing on those walls because there is such a big world out there full of people who need us and it’s important to see and address those needs when we can. I thought it would be great for them to serve others and to understand how lucky we are. As we pulled in the first day to volunteer there was a gathering of people waiting for the doors to open. 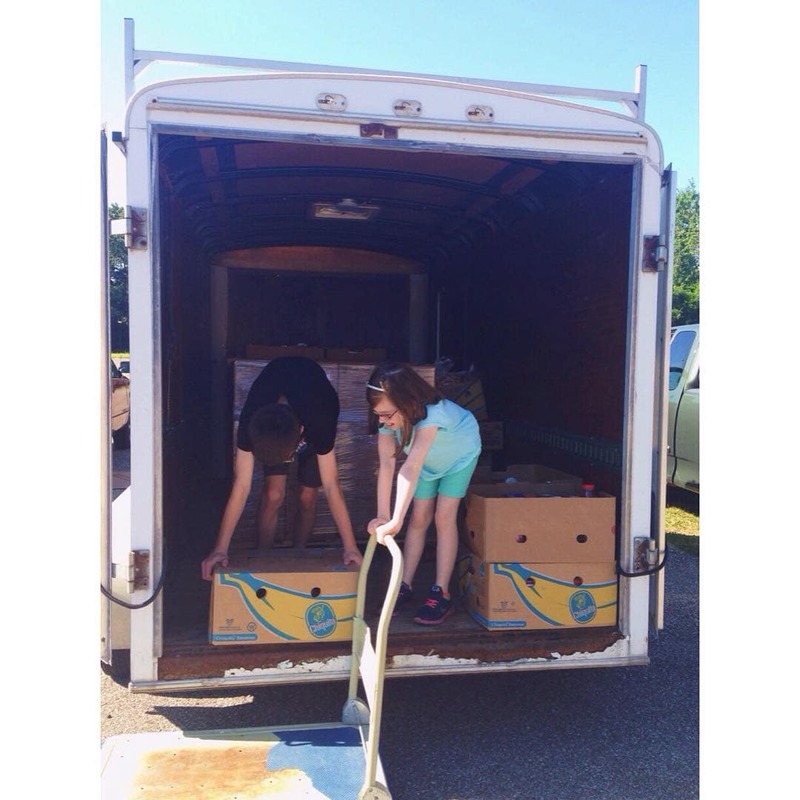 At the time we had pulled in, there was TWO MORE HOURS until the food pantry doors were open to the public. When I asked about this, I was told that they arrive that early to be able to be the first to select the food. The food given would last a family of 4 a few days, an incredible offering when one needs it, but it made me very ashamed about my attitudes towards feeding my family. I can plan meals for my family and buy whatever we need for the week in one trip without any worries. I complain when the grocery line is too long, but others wait for hours just in the hopes that they will have fresh produce. I whine about how annoying it is to have to haul so many bags from my car and put them away. Guess who had the transformation? I know we can’t always go into that zen place of happiness when planning our meals, but I’m working on my attitude and I want to do what I can to simplify this process for our family. It’s a bit of a privilege to go into the store with a plan and come out with what we need, isn’t it? Meal planning is necessary to stay on budget. In fact, as I have said in my book, I feel that this is one of the biggest places I feel families should analyze when living on a budget. This is a flexible area in our spending, but it takes a good plan to stay on budget. The overachiever in me really believes that I will cook a great meal for my family every night. The reality is that many nights I am running kids to activities and I am not home (or too tired) to execute all those good intentions. What happens when you have a lot of intentions and not a lot of time? Spoiled food and wasted money. I shop for 5 meals for the week, giving us two nights for leftovers and reality. Kind of the same thing- ha! Take a serious look at your calendar and analyze what will be happening for the week so that you can create a menu plan that will serve your family well. Slow cooker dishes are arranged on busy days where I don’t have time for food preparation, Sunday suppers are leisurely meals with all the fixings doubled so we can enjoy the dish another night, and grocery days are often prep days for chopping and dicing for quick wraps & salads for nights I don’t have the time to cook. I am a lover of routines and that also comes to the food that we share around the table. In our house, we usually have one slow cooker dish, one pot of soup or a large salad (depending on the season), some type of taco night, one “fancy” dish for Sundays, a brunch dish (that later acts as breakfast on busy school mornings), and I try to implement one new recipe a week to keep things fresh. A rotation schedule creates a clear routine for a busy week and makes grocery shopping easier since you know what you typically need each week. I try to make one dish that can easily be doubled or tripled since we have been working on weekly entertaining or to share with someone who might be having a hard week. This can also be a great time to feed the freezer for another week. It would be hard not to be inspired now that we have tools like Pinterest at our disposal. I think more than anything it is not to feel OVERWHELMED with all of the meal choices or choosing dishes that are far too ambitious for your time constraints. My best bet for busy weeknights are 30-minute recipes or 5-ingredient or less ideas and that is typically what I search for when hunting down new dishes to add to my menu. What did I ever do without my smartphone? This little device has made creating and maintaining my grocery lists each week so much easier. I am a BIG fan of the Grocery iQ app (FREE!) for creating my grocery list because you can reuse the same master list that you use over and over again (especially if you have a routine rotation of meals) and this app automatically organizes and finds any coupons that you might want to use for your purchases. 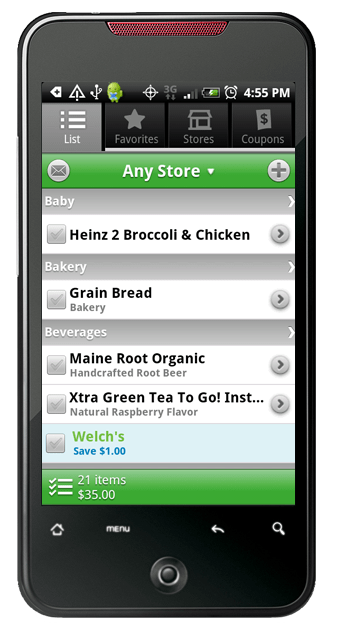 With Grocery iQ you can type, speak, or scan grocery list items into your list. The list automatically adds your items into categories and then alerts you if coupons are available for any items you might be adding to your list. Coupons can then be sent to your email when your list has been made or (if you have a wireless enabled printer) can be sent to your printer for printing. As you gather your items from your list, simply check it off and the item moves to the bottom of the list. Once your whole list is complete, everything is shifted towards the bottom and then can simply be clicked to add those repeat items back on the list for your next visit. Switching to an electronic list was much easier than I expected. It also keeps me off my phone while shopping so I can really concentrate which is half of the battle for me when it comes to menu planning. In our family, every person has a favorite dish or a favorite memory of a meal we have shared together. To make your week easier, creating a family journal or scrapbook where you have all your family favorites for weekly inspiration and rotate a family member’s favorite each week. 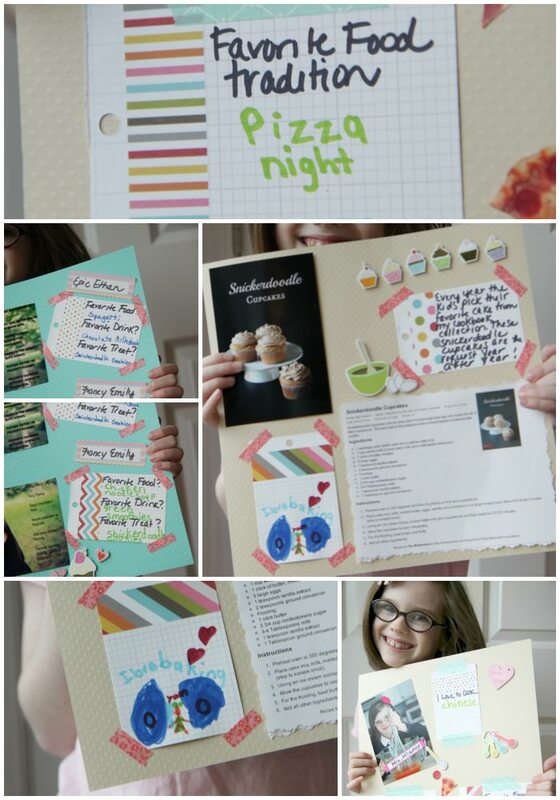 We made a food journal and printed out our favorite recipes and why the kids loved these dishes. This can be a fun craft project to do together AND it is something you can pass on to them when they leave the nest (but that won’t be for a LONG time so I’m not worried). 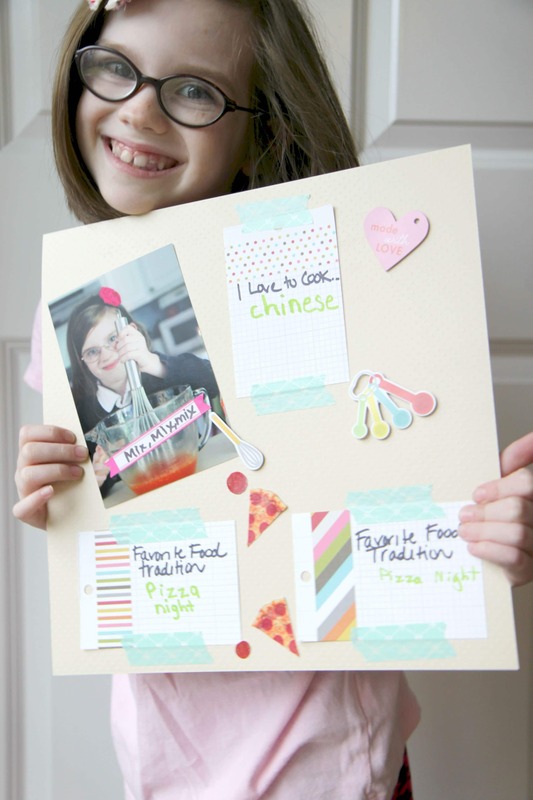 If you want to try making your own cookbook, you can see this tutorial we created for it! One thing I don’t think very often about is that many of our favorite recipes are online. If the sites ever go down (which has been known to happen), we may no longer have access to our favorite dishes. I want a place where we can keep all these food memories so a family journal is a fun activity that you can enjoy for years to come. I have many friends that deal chase for their menu plans, but I have never been much of a deal chaser. As the extracurricular schedule grows and my work becomes more demanding, I have to make choices about what I realistically can and cannot do. It’s okay to not chase deals. I do my menu planning first thing in the morning (eat the frog!!) and I go to grocery stores where deal chasing doesn’t need to happen. ALDI has (and always will be) my first destination for our family groceries and thanks to the Savings Catcher app, a scan of my receipt at the end of my shopping at Walmart means I can look forward to pocketing any savings if any store goes lower in prices without chasing deals anymore. You may find shopping at night is better for you or you may get a thrill from a deal well chased. Pick what’s important to you and make it happen for your family, but do what fits best with your own lifestyle for menu planning success. Do you have any strategies you can share for menu planning? Let us know in the comments below! Well, it has finally happened- I got an email from the corporate office at Aldi. The VP of the company emailed me to tell me how much they have appreciated our endeavors to support their company and even said he might be sampling some of the recipes that we have featured on the blog. It was a very heartfelt and sincere note, so much thanks to those of you who have spread the word about our corner of the internet! It is good to know that they know what we are up to and how much we enjoy their great food. Here is this week’s menu planner & grocery list. Please send your Aldi-friendly recipes my way to [email protected] so that I can have some new ideas for next week’s planner! I just wanted to thank everyone who has emailed or left a comment about how much they are enjoying these planners. It really has made my week to know that these are helping some tired moms plan their evening meals. It has helped me too as I have to be more dedicated towards the planning of our own meals to make them ready to be published on here. Hope everyone has had a wonderful week! Enjoy your new planner & grocery list! Let me know how the recipes turn out- it helps to know which ones to repeat again. Here are this week’s planners. Hope it makes your grocery day easier! Let me know what you guys think and I am so happy to hear that most of you are enjoying the new format! I am going to try something different this time and I am VERY anxious for your feedback. Please click and leave me a comment about the new format and let me know how I am doing. I have decided to make these lists printable PDF files for everyone. There will be two files- a grocery list & a menu planner with all of your recipes on it. This is a lot of work to put together each week, but this is the most user-friendly way that I can do these and make it easy for you to print and take with you to the grocery store. In light of that, it is difficult for me to price everything out each week so I will be omitting the final cost. I do guarantee that you will never spend more than $50 on groceries every week and most times you will spend much less than that since many of my recipes contain ingredients that you already have in your pantry. I know that there are many services out there that require you to pay for something like this and I would never charge you. The only way I am able to stay home with my kiddos and run something like this though is through you visiting the awesome sponsors that we have on our site. These people make my job possible and without them I would not be able to do this. The other way that you can support us is by sharing our site with your friends, family, neighbors, strangers- anyone and everyone! Please send me feedback- I need it as it keeps me motivated!